On the second day of Computex 2016, AMD unveiled the AMD Radeon RX 480, the first salvo of their “Water Drop” strategy for the upcoming AMD Polaris architecture. Their “Water Drop” strategy is focused at releasing new graphics architectures in high volume segments first to maintain market share growth for Radeon GPUs. Set for launch and availability on June 29, 2016, the new AMD Radeon RX 480 will deliver more than 5 TFLOPS of performance at just US$199! The Radeon RX 480 is both HTC Vive-Ready and Oculus Rift compatible. AMD expects the Radeon RX 480 to jumpstart the growth of VR adoption by offering premium VR experience at less than half the current cost. We were present at the Westin Taipei, when Raja Koduri, Senior Vice President and Chief Architect, Radeon Technologies Group, revealed the AMD Radeon RX 480. Check it out! In the final minutes of his presentation, Raja Koduri showed how two Radeon RX 480 graphics cards can beat the new NVIDIA GeForce GTX 1080 graphics card for far less money. Based on the sub-$500 price, the results are based on the 8 GB variant of the Radeon RX 480. What’s really odd is that Raja Koduri explicitly pointed out that the two Radeon RX 480 graphics cards were only utilised to 51% to slightly best the GeForce GTX 1080. Those are frankly, really odd numbers. 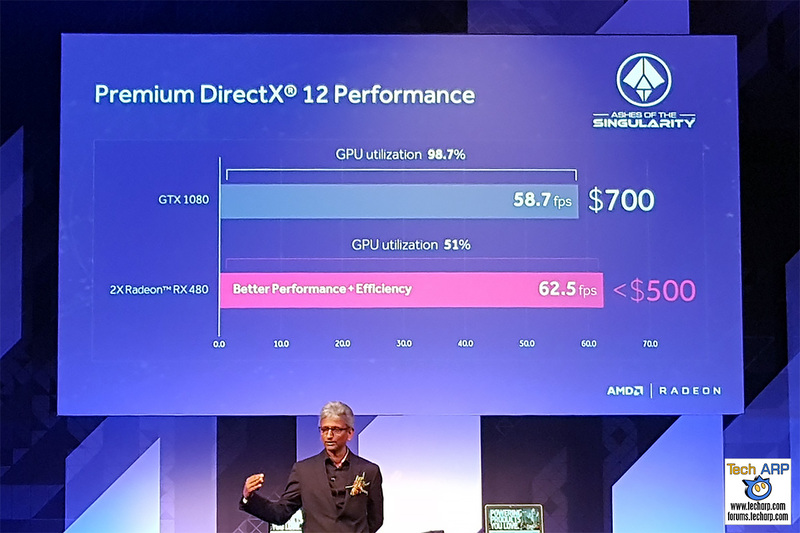 We now know how AMD derived those results. Check out our 2-page explanation of what those odd results mean, and what the REAL results are! The AMD Radeon RX 480 will come in two variants – one with 4 GB of GDDR5 memory, and one with 8 GB of GDDR5 memory. The Radeon RX 480 with 4 GB of GDDR5 will sell for US$199, while the 8 GB variant will sell for US$229. AMD will also announce the Radeon RX 470 and Radeon RX 460 graphics cards, based on the same AMD Polaris architecture and 14 nm FinFET fabrication process. The AMD Radeon RX 470 (codenamed Polaris 10 Pro, formerly Ellesmere Pro) could have a TDP of 120 W.
More details on the Radeon RX 470 and Radeon RX 460 should be revealed during the official June 29 launch.